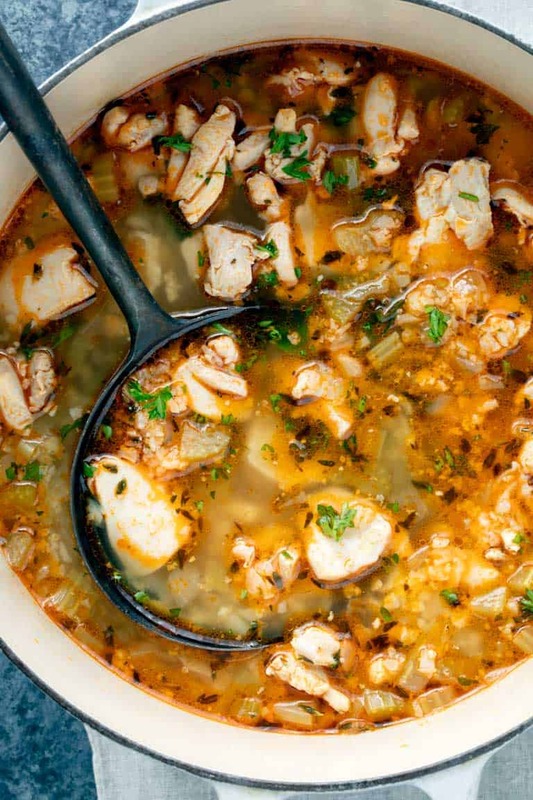 This Keto Chicken Soup with cauliflower rice will cure what ails you this cold season. Not only is it ultra-comforting and delicious, but it’s under 200 calories per serving and ready in less than 40 minutes! It’s rich and satisfying but grain-free. Even the kids love it! ~It’s Stephanie here with a new cookbook review! I love soups and stews and will make them year round, but during the winter they are a major staple in my house. So I was psyched when Carolyn Ketchum’s new cookbook Keto Soups & Stews landed in my lap. Carolyn is the mastermind behind the awesome low-carb and gluten-free blog All Day I Dream About Food and author of several ketogenic cookbooks. We already gushed about reviewed another one! Keto is short for ketogenic which is a low-carb, high-fat diet. It causes the body to go into a metabolic state called ketosis, which burns fat for energy instead of carbohydrates from food. Weight loss is one of the most popular benefits, but there are studies that show if may also help with diabetes, cancer, epilepsy and Alzheimer’s. If you’re interested in learning more about if it is right for you, how to get started or what resources to seek out, this episode featuring two registered dietitians on This Unmillennial Life is a good one to check out. Carolyn’s cookbook is perfect if you are just starting to think about Keto and low-carb or have been following a Keto diet for a while. She starts out with lists of kitchen tools and pantry items you’ll need. Luckily her soups and stews are really accessible, so you probably already have everything you need to dive right in. There’s a great section on special Keto substitutions which is really helpful. Like swapping sliced cabbage for noodles, cauliflower rice for rice and turnips for potatoes. I especially love Chapter 1: All About Broth. Carolyn does an amazing job describing the difference between bone broth, regular broth and stock and provides recipes to make your own, which I highly recommend when making soup. I was really excited to try this Keto Chicken Soup. I’ve used cauliflower rice as a side and an addition to salads, but I’ve never tried it in soup. It was awesome. It added just the right amount of flavor and texture, so you truly don’t miss the rice. Here’s how to make the cauliflower rice: Cut the cauliflower in half and remove as much of the stem and leaves as possible. Then, cut the cauliflower into small florets removing any of the remaining stem. Place the cauliflower florets in a food processor or blender and pulse just until the cauliflower is broken down into small rice sized pieces. If you don’t have a food processor or blender, grate the cauliflower on the large holes of a box grater after cutting in half and removing the stems and leaves. You can also use purchased fresh or frozen cauliflower rice to save time! 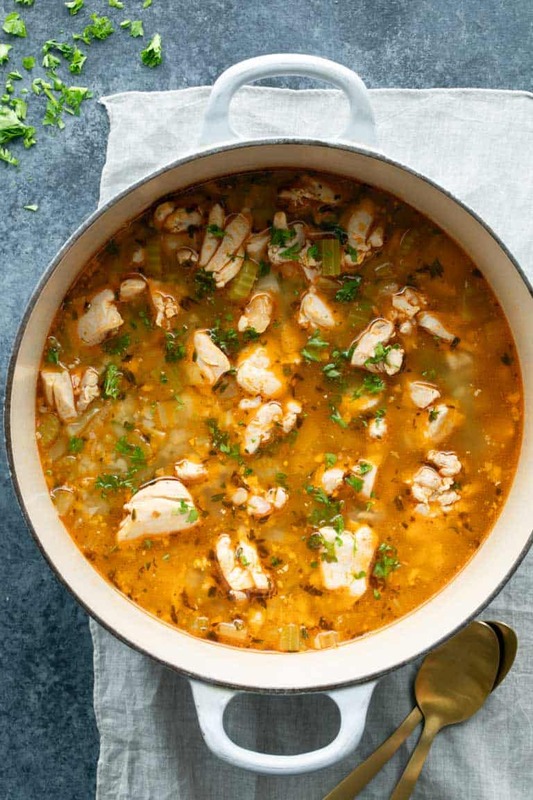 From there, this Keto Chicken Soup with cauliflower rice is super simple to make: Just sauté the onion and celery and then add in the aromatics. This will help bring out the flavor of the garlic, thyme and paprika. Then stir in the broth and then add the chicken and riced cauliflower and simmer until cooked through. To turn this keto chicken and cauliflower rice into a low-carb chicken noodle soup, just replace the cauliflower rice with low-carb noodles of your choice! I love the idea of adding zucchini noodles! It’s ready in just over 30 minutes. I love the gorgeous orangish-red color and subtle flavor the paprika adds and the chunks of chicken thighs are tender and perfect. It is surprisingly flavorful. We added on some parsley for a bit of color, but feel free to omit it if you don’t have any on hand. Carolyn points out that soups and stews are actually the perfect Keto food. They’re simple, easy and adaptable. If you’re new to the Keto diet or cooking in general soups are a great place to start. Don’t have this or want to add a little more of that.. go for it. They’re economical. The Keto diet can be expensive with its emphasis on organic protein, but soups and stews allow you to stretch your ingredients. They’re quick. There are not many pre-made convenience foods available on the Keto diet, but many soups and stews can be ready in under 40 minutes making them the perfect weeknight dinner. They’re great for meal-prep and make ahead meals. Make them ahead and then pack them up for the perfect lunch on the go. They’re scalable. Have a big family… double the recipe. Cooking for just yourself… then make half. Most of these recipes can be adjusted very easily. They’re accessible. No weird ingredients you’ve never heard of or will never be able to find. You’ll be familiar with all of the ingredients, which will be really comforting when you are adjusting your nutritional plan. They’re healthy. This is the most important one. All of these recipes are chocked full of beneficial nutrients. Especially if you make your own broth! 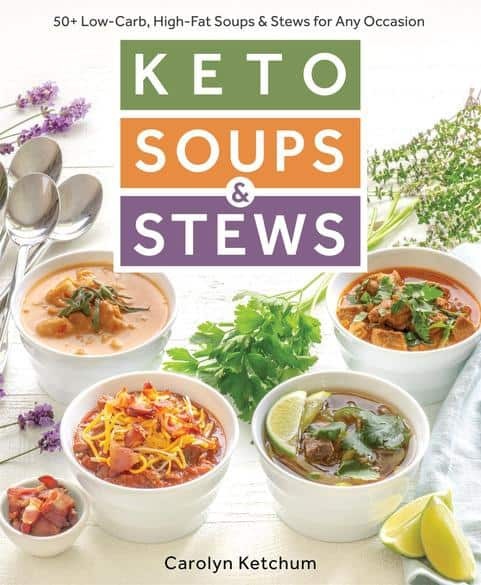 I can’t wait to try some of the other recipes in Keto Soups & Stews. Like Spicy Tomato Bisque with Crispy Pancetta, Beef Mushroom and “Barley” Soup and Slow Cooker Cheddar Jalapeño Soup. So many soups, so little time! This cookbook is great even if you aren’t following a Keto or low carb diet. Seriously, who doesn’t want a book filled with healthy and flavorful soups that your whole family will love! Make sure you pop over to Instagram and get in on a chance to win a copy for yourself! Or if you are ready to go for it, here’s a link on amazon. 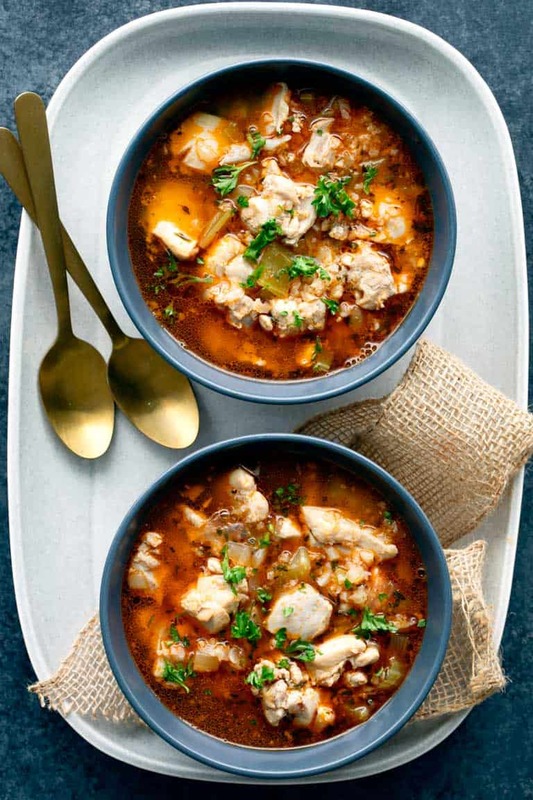 This Keto Chicken Soup with cauliflower rice is ultra-comforting, delicious and ready in less than 40 minutes. 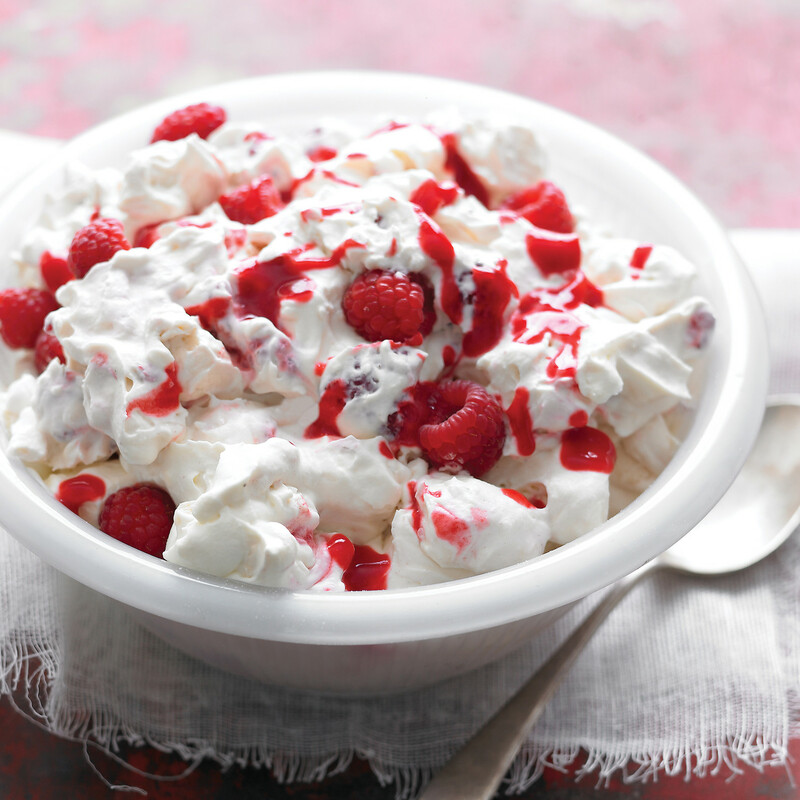 It’s low-carb, kid-friendly, paleo-friendly, dairy free, grain free and gluten free, too! Heat the oil in a large saucepan over medium heat. Add the celery and onions and season with salt and pepper. Cook, stirring frequently, until the vegetables are tender, about 5 minutes. Add the garlic, thyme, and paprika and cook until fragrant, about another minute. Stir in the broth and bring to a boil. Add the chicken and riced cauliflower and reduce the heat to a simmer. Cook until the chicken is cooked through and the cauliflower is tender, about 12 minutes. Adjust the salt and pepper to taste. Cook and freeze this soup without the cauliflower and then add the cauliflower when reheating the soup, so it does not get mushy.